Is there a visual reference for how to use Nature Maestro? How do I get audio help while in the app? Tap the First Aid kit on the pop-up Dennis while in Explore. If you listen through to the directions, you'll hear most of what you need to know to begin creating your own soundscapes! How do I pull animals into the screen? In Explore, you will see a scrollbar of animals and weather icons on the right. If you don't see them, tap the Animal Tracks button in the lower right corner. Drag and drop an animal anywhere into the biome. You can move any animal or weather event around as you please. How do I remove an individual animal? Tap the animal 4 times and it will leave the soundscape stage. How do I remove all the animals? You can remove all the animals by shaking the iPad up and down or right to left. Be careful and hang onto the iPad : ) as you do this! How do I record my soundscape? Tap the microphone next to Dennis's boot. It will open a window where you can select 'biome.' A tone will sound and your soundscape recording has started. Tap the microphone again and the recording will stop. Tap the microphone again and you have a choice to re-record the 'biome' or 'preview' what you just recorded. When in record mode, you can tap any animal and that sound will be included in your recording. If you like your soundscape recording, make sure you share it by tapping the share button in the upper right-hand corner. Each time you record, the previous recording will be erased. But if you share it, you can listen to it over and over again. How do I listen to information about the animal? Tap the animal or weather icon 2 times. If you want more detailed facts, tap the home (Tent) button in the upper left hand corner and return to the splash page. Tap the fact cards on Dennis' pocket and you will go to the fact cards for that particular biome. All of the fact cards have an audio button you can play and pause to hear Dennis reading the text verbatim. How do I turn an animal to face the other way? Tap 3 times. You can also rotate the animal any way you want. How do I make an animal call louder or softer? Pinch the animal with 2 fingers to make them softer and smaller. Zoom the animal with 2 fingers to make them larger and louder! How do I access the Compose feature? Tap the blue bar at the bottom of the screen. You will see 5 or 6 buttons. If you have not added any animals to the biome from the Animal Track menu, you will only see 5 buttons. Once you add an animal, you will see the Compose button. Tap the Compose button and the Compose window will open. Each animal has its own track. If you have a number of the same animal (say 4 monkeys) in the biome, you will see all 4 in the same track. You can move any animal to the right or left to have them call at a different time. As you move them, watch the time text at the bottom of the Compose window. It will tell you when the animal will sound once you leave the Compose window. If you have a bunch of animals in the biome, you may have to scroll the Compose window up and down to see the animal track. What other buttons are in the Compose menu? Surprise button: Tap it and a random animal or weather event will flow onto the soundscape stage. Melody Button: Tap 1 time and you'll hear a melody. Tap again and you'll hear a different melody. Tap a 3rd time to turn the melodies off. Rhythm Button: Tap 1 time and you'll hear a rhythm. Tap again and you'll hear a different rhythm. Tap a 3rd time to turn the rhythms off. Background Mute Button: Tap and the background ambience will mute, allowing just the animals to call. Topnote Button: Tap and you'll see a timeline with a cursor display at the top of the soundscape stage. The loop is two minutes long. You can follow where you've placed the animals in the soundscape loop. Watch the animal as the cursor goes by! Compose Button: Tap and the Compose window will open. You must have at least one animal or rhythm or melody on the soundscape stage for this button to display. How do I know where the soundscape loop is time-wise? Tap the menu bar at the bottom of the soundscape stage. Tap the Topnote button and you'll see a timeline with a cursor display at the top of the soundscape stage. The loop is two minutes long. You can follow where you've placed the animals in the soundscape loop. Watch the animal as the cursor goes by! How do I share the images I've created? Tap the button in the upper right hand corner of the soundscape stage . You can share an image of what you've created. In a future version, you'll be able to share the soundscape you've created in an mp3. How do I turn rhythms and melodies on and off? Tap the menu bar at the bottom of the soundscape stage. Tap the Melody Button 1 time and you'll hear a melody. Tap again and you'll hear a different melody. Tap a 3rd time to turn the melodies off. Tap the Rhythm Button 1 time and you'll hear a rhythm. Tap again and you'll hear a different rhythm. Tap a 3rd time to turn the rhythms off. How do I see other biomes? Tap the Tent button in the upper left hand corner. That will always take you back home to the splash page. When on the splash page, tap the Dennis button in the lower left hand corner to change biomes. 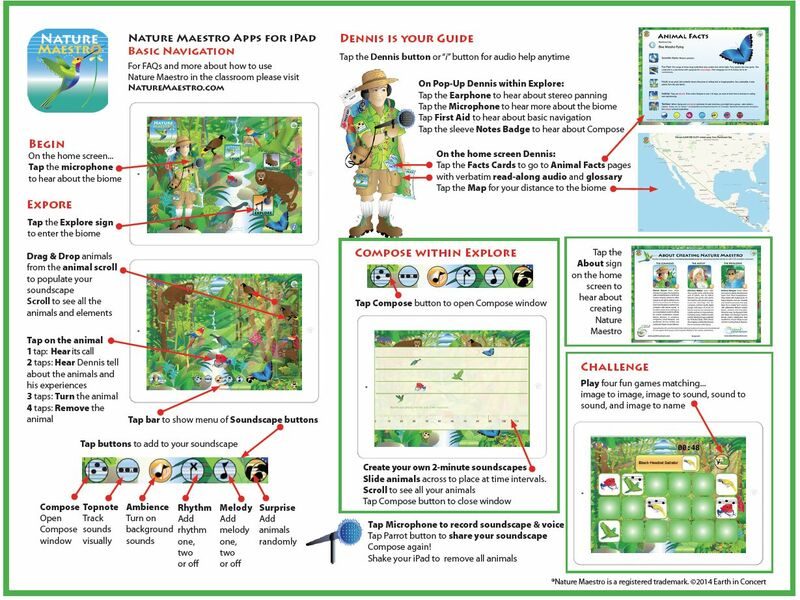 Note: this feature is only available in the Nature Maestro : Expedition version. What are the challenge games? There are 4 Challenge games to test your memory and enhance your listening skills. Go to the splash/home page by clicking the Tent icon in the upper left hand corner. Click on the Challenge sign . While on the Challenge page, you can select between 'match animal to animal' ; 'match animal to sound' ; 'match sound to sound' or 'match animal to sound and hear the common and scientific names.' If you click the button on the top right, you'll see the different icons. You can play the game and play again to beat your own time or someone else's time! Where are more detailed facts? On the splash/home page, tap the fact cards on Dennis' pocket. How do I access the map? On the splash/home page, tap the map on Dennis.